One of the primary reasons homeowners in Sacramento want to make the switch to a solar power system is to save money on energy. It’s the most popular reason we get from the customers we have the opportunity to work with. The second and third reasons tend to be energy independence and to help the environment. Some think that solar power still has too high of a barrier to entry, and that the investment over 20-30 years isn’t worth it. Here at West Coast Solar, we wholeheartedly disagree. Each person will have their opinion, and we welcome it; however, when we have customers saving money on energy use after a few years of using solar power—while also experiencing the other benefits of renewable energy—we’re confident we know what we’re talking about. Nonetheless, one of the benefits to solar power are solar power incentives! In this post, we’ll share the federal solar tax credit you can take advantage of until 2021. In the last post, we discussed getting bids from solar power companies. Who knows, the government may extend solar incentives before the time comes, but it’s best to get in on this incentive now. Also, we’ll share a state, local, and utility-based incentives tool you can use. If you’re ready to talk about making the switch to solar power, give West Coast Solar a call now. We stay on top of emerging incentives and help our clients save money at every stage of the process. Otherwise, continue reading to find out more! Question #6 – What are some solar power system incentives? Solar power incentives are a great way to save money long-term with your solar power investment. The US Internal Revenue Service offers a residential renewable energy tax credit until 2021. The percentage of credit you can claim reduces every year until it expires; however, if you take advantage of it sooner than later, you can get a rebate of up to 30 percent for qualified solar power system expenditures. A US taxpayer may claim a credit of up to 30 percent for a system installed and utilized on the residence they own. Expenditures in respect to the hardware of the system are considered process once the system has been completely installed. For those installing a solar power system for their home, the “placed in service” is defined as the homeowner’s date of occupancy. Other expenditures can include labor, assembly, wiring, and interconnection. What’s more, if the tax credit for your solar power system exceeds your tax liability, the excess will be rolled over to the succeeding year. The Energy Policy Act of 2005 established the federal tax credit for small solar power systems for homes. It was initially applied to solar-electric systems, fuel cells, and solar water heating systems. In 2008, the Energy Improvement and Extension Act extended the allowed tax credits to geothermal heat pumps and small wind-energy systems, which was effective on 1 January 2008. Further extensions to the act advanced the solar incentives to residents of the country. Eventually, in February 2018, the tax credit was extended, once again, to encourage resident solar power systems to be installed across the country. If you want to do more in-depth research to find incentives, you can use a national tool that provides state, local, and utility-based incentives called the Database of State Incentives for Renewables and Efficiency (DSIRE). As the most comprehensive source of incentives and information for renewables and energy efficiency, DSIRE is a great tool to use to find ways to save money for your solar power system installation. After years of servicing Sacramento, we’ve come to know exactly what it takes to design, install, and maintain solar power systems for homes. One area of intense focus for potential customers is the financials, and we’re ready to help you get the best deal possible. Incentives, tax credits, and reduced utility bills all make a difference when it comes to a 20-30 year investment. 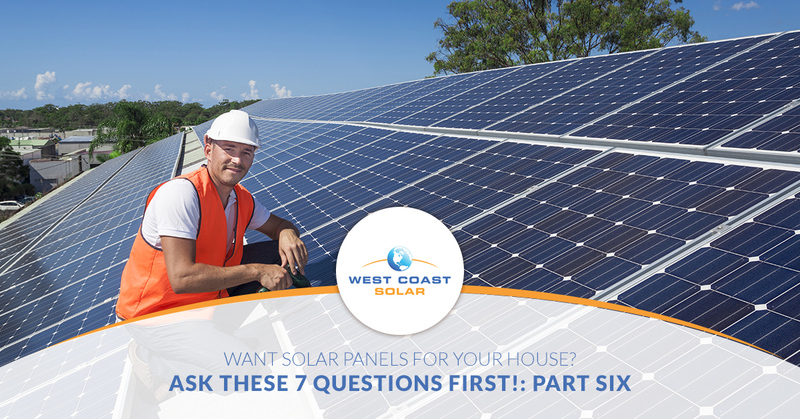 Are you ready to discuss solar power with an expert? Call West Coast Solar today! In the final post of this blog series, we’ll talk about how you can effectively and efficiently work with your installer and utility company to make your solar power system come to life. If you want to read the rest of this blog series, start with part one!